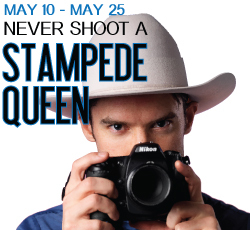 VANCOUVER, BC: West End Productions is pleased to present the Vancouver debut of Never Shoot a Stampede Queen May 10-25 at the Granville Island Stage. Starring Zachary Stevenson (the Arts Club’s Buddy Holly), directed and dramaturged by TJ Dawe (hot off his acclaimed solo show Medicine), and adapted for the stage from the Leacock Medal winning book by the author, Mark Leiren-Young, this new comedy is a collection of true life tall tales from BC’s real-life wild west. Never Shoot a Stampede Queen follows the adventures of a big city (Vancouver) boy who arrives in a real life cowboy town (Williams Lake) and discovers stranger news, quirkier characters, and better friends, than he ever could have imagined. Following its publication in 2009, Never Shoot a Stampede Queen – A Rookie Reporter in the Cariboo won the Leacock Medal for Humour and spent 16 weeks on the BC Bestseller’s list. Dawe, a fan of the book, approached Leiren-Young about adapting the story for the stage. The Arts Club Theatre offered the duo the chance to workshop a script last year as part of their 2012 Scene First program with Ryan Beil. Beil is performing Never Shoot a Stampede Queen at the show’s World Premiere at the Western Canada Theatre Company’s production in April, which is also being directed by Dawe. Never Shoot a Stampede Queen runs May 10-25th, nightly at 8 pm (Sundays dark), with 2 pm matinees on Saturdays. There will be a special preview May 9th and talkback sessions with both the playwright and star in attendance on Wednesday nights and after the Saturday matinees and the special preview. Tickets are $25-45, and are available at Vancouver Tix. All performances will take place at the Arts Club Granville Island Stage, 1689 Johnston St.